Provident Living Preps | "Organize yourselves; prepare every needful thing, and establish a house, even a house of prayer, a house of fasting, a house of faith, a house of learning, a house of glory, a house of order, a house of God." "Organize yourselves; prepare every needful thing, and establish a house, even a house of prayer, a house of fasting, a house of faith, a house of learning, a house of glory, a house of order, a house of God." It’s getting cold outside and I AM FREEZING! I can’t even imagine handling life when I feel like an icicle, which is exactly what would happen if the power went. If utilities go out in the winter because of a natural disaster like a snow storm, wind storm or an earthquake, we will all face the prospect of turning into human popsicles unless we know what else we can do to keep warm. The threat is real, but as the Lord said, “If ye are prepared, ye shall not fear.” That’s why it’s important to educate ourselves and work toward becoming better prepared. I imagine that some people think they’d be out of the woods in this type of emergency because they have gas appliances. But in many cases, a natural disaster will disrupt gas service, as well as electricity and plumbing. If you’re lucky and it doesn’t, don’t be surprised if your gas appliances still don’t work when the power goes out. In most cases, gas powered furnaces and stove-top ranges/ovens require electricity to use the controls that turn them on. If your gas appliance doesn’t require electricity to be able to start, it may still require electricity to actually circulate heat. That goes for gas water heaters, as well. If your gas water heater has electrical controls on it, you won’t be able to operate it when the power is out. You can still access the water inside the water tank, but it will be far from warm. If you’re fortunate enough to be able to use your gas stove-top range/oven during a power outage, it’s still not a good idea to try to heat your home for long periods of time with it because of the risk of carbon monoxide poisoning. Having a generator is a great idea! However, if you don’t have a generator with solar capabilities, can’t afford one, or can’t store the amount of fuel it takes to run a generator for an extended period of time, there are other ways to stay warm when it’s cold outside. BUILT-IN FIREPLACE It might be obvious, but a permanent wood-burning fireplace is a great heat source when the power is out. All it takes is a good supply of wood to keep it burning. Chimneys of modern fireplaces are triple-walled. The smoke travels up the center part of the chimney. The walls create two air passages around the central chimney, which are connected at the bottom. Cool air from outside enters the outer passageway, traveling downward. When the cool air reaches the bottom, it’s warmed by the fire and travels back up through the second passageway. This ensures that the outer passageway is always cool, preventing the possibility of starting a fire. The problem with a permanent wood-burning fireplace is that it needs a blower to be able to spread warm air from the fireplace into the home. Inserts can be installed inside a fireplace to draw cool air in from the floor and return it to the room as hot air. These inserts consist of a series of metal tubes that surround the fire. These either work by an electric blower motor or by convection. In the case of an emergency, a convection insert that doesn’t require a motor would be the better choice, as it wouldn’t require electricity to work. However, the convection models don’t move as much air into the home, as do the inserts with blowers. PERMANENT WOOD OR COAL BURNING STOVE A wood or coal burning stove is a like a metal fireplace, which allows the fire to be placed closer to the center of the room. The metal stove radiates heat from all sides, as well as from all sides of the metal tube chimney, making it much more efficient than a fireplace. Often, both wood and coal can be used in metal stoves. The important thing to remember is to store enough fuel for your needs. 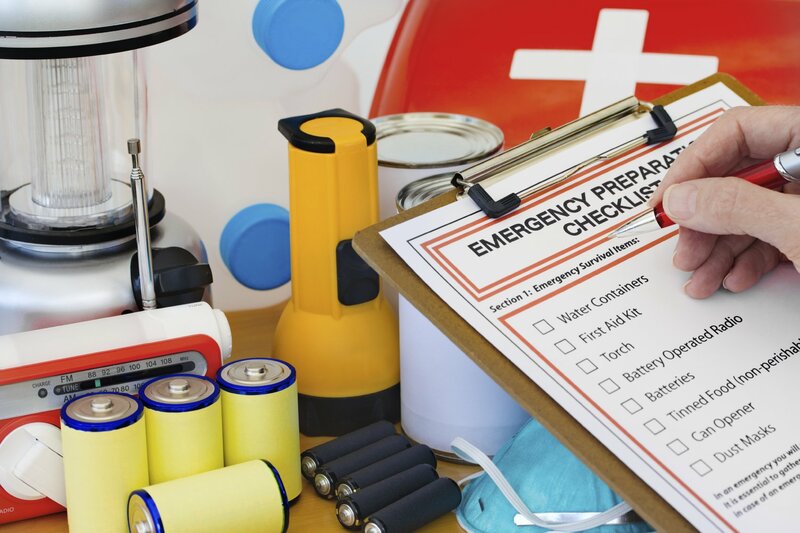 If the power is out for more than a few days, which is likely in the case of a natural disaster, it’s likely that you’ll need fuel to last for at least a week, and up to a month or more. Permanent fireplaces and wood-burning stoves are great, but many states have ordinances restricting their use on yellow and red burn days to reduce the amount of pollution in the air. It’s important to know if you are allowed to use this method of heating in your area on a regular basis. I would imagine that in the case of a natural disaster where power is out for a longer period of time, their use wouldn’t be restricted by government, but it’s a good idea to have a backup plan just in case. For emergency heat, a portable wood-burning stove can be installed on a temporary basis. All you need is a stove, several feet of chimney pipe with an elbow, a piece of plywood and a window. The stove can be placed close to the window and the chimney pipe can be directed out through an opening made in the window by removing one of the glass panes. The extra space in the window made by removing the glass can be closed up with plywood. Just be sure to place a silicon or fiberglass fire-proof mat, or large ceramic tiles underneath the stove to avoid causing a fire and to protect the floor from excess heat or stray embers. If you are using a wood-burning stove for emergencies, you may want to consider buying one that uses wood or multiple types of fuel, and not just pellets only unless you plan to store plenty of pellets. The wood pellet-only stoves are more efficient, producing more heat per pound of wood than the others, but they can’t be used with normal firewood. That means that when you run out of pellets, your heat is gone. It is very important to have enough fuel on hand to last the duration of the time you’ll need to use your stove and it’s always a good idea to store more fuel than you’ll actually need, if it’s allowed by law in your area. These heaters are relatively clean burning and produce a lot of heat. Like a wood-burning stove, kerosene heaters radiate heat from all sides, allowing for maximum heat output. There is no chimney, so heat isn’t lost from a chimney. Propane heaters like the “Buddy Heater” are generally safe to use indoors, but it’s always a good idea when using any sort of heating method to have a battery-powered carbon monoxide monitor on hand to warn you of possible carbon monoxide poisoning. KEEP THE COLD OUT BY SEALING DOORS & WINDOWS Make sure all of the windows, doors and vents in your home are sealed. If you are running a heater or using a fireplace, be sure to have ventilation for those, but if you’re simply trying to keep out the cold, seal everything. If there are cracks in the windows or doors, having some caulk on hand to seal those up would help improve heat retention. If caulking is not an option, cover any broken seals or drafty doors with duct tape or weather-stripping, and shove blankets, pillows or towels in the cracks. Do whatever you can to stop the outside air from coming in and you will find that the temperature inside will rise. It’s also a good idea to cover windows with foil, cardboard, plastic sheeting such as cheap transparent shower curtains, blinds, curtains or blankets. This will create another barrier to help trap the heat inside. If it’s sunny outside, though, having the light shine through the windows will help to warm up your home. Covering your air vents will also prevent warm air from escaping and cool air from entering your home. PICK A ROOM If you’re trying to stay warm, pick a smaller room and congregate there. The heat from multiple bodies will raise the temperature a bit, but you’ll definitely need to close off and seal the room. Pitching a tent or making a blanket fort inside the room will add insulation and can increase your ability to stay warm. If you have hardwood or tile floors, adding carpet, a rug or even a blanket can help with insulation. SLEEPING BAGS A great sleeping bag with a negative degree temperature rating will greatly increase your level of comfort at night, but it can also be used to keep you warm during the day. A sleeping bag temperature rating is the manufacturer’s best guess at how warm the bag is for the average person. Manufacturers decide ratings based on those who test the bags in various environmental conditions. Each sleeping bag is tested differently, so as a general rule, it’s a good idea to go with a bag that’s rated as colder than you think you’ll need, or plan on purchasing an additional wool or fleece sleeping bag liners/inserts to increase warmth in colder temperatures. Many people who spend time in extreme temperatures would likely agree that a sleeping bag is rated about 20-30 degrees warmer than it actually feels. If the temperature is 10 degrees outside, then you will definitely want a -25 degree sleeping bag or a zero degree bag with a really good liner/insert. What you’re sleeping on can also make a difference. It’s a good idea to think about using your sleeping bag on top of an insulated mat or sleeping pad to increase your ability to retain heat. And consider sleeping with another person, as another person’s body heat will help you keep warm. Cuddling with someone while you’re not sleeping is also a great idea. The following sleeping bags are some of my favorites. 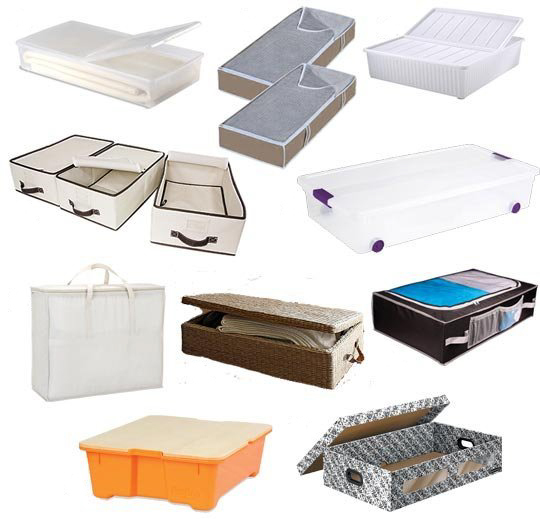 They are high quality, durable bags at a reasonable price. They have some great features, including that they can be purchased in a double bag size or individual bags can be zipped together to create a bag big enough for two or three people, depending on the size of the people. What you’re wearing can make all the difference when it comes to staying warm. The greatest amount of heat can be lost from the head, so cover up with a hat, wrap a scarf around your neck or head, and wear lots of layers. When layering, it’s best to start with just a few layers and add more when you need them. It’s a good idea to have a base layer to wick moisture away, a mid layer to trap heat in and a waterproof outer layer for protection against the elements. In addition to tips like choosing wool over synthetic fabrics, it would be a good idea to wear an outer layer with zippers and vents to let in air, in case you get too hot and perspiration gets trapped inside your jacket. Gloves and a thick pair of calf or knee-length socks, especially wool socks, are a must. Bathrobes, blankets and snuggies are a great additional layer to help keep you warm when the power is out. THE DIFFERENCE BETWEEN NATURAL & SYNTHETIC Wool is great because it insulates when wet, unlike cotton, which only insulates when dry. Cotton is hydrophilic, meaning it’s not good at wicking wetness away from the skin and can become damp by being exposed to humidity. Never use cotton as a base layer in cold weather situations. Once cotton is wet, it can lose up to 90 percent of its insulating properties and will wick away heat from your body 25 times faster than when it’s dry. When cotton gets wet, water fills up the tiny air pockets that otherwise would provide insulation. Water doesn’t cling as well to wool as it does to cotton, wool can get wet without its tiny air pockets being filled up with water, so it still reduces heat loss by convection. HAND & BODY WARMERS Aside from gloves, hand warmers are a good idea to keep “handy.” You can stuff them inside of gloves or shoes for instant warmth. Hand warmers can be homemade or store bought. Rubber water bottles filled with hot water can also be used to create warmth, as well as wrapping a hot rock in a towel and placing it next to the body or in the bottom of a bed or sleeping bag. But don’t forget that if you are using water to keep yourself warm, in an emergency situation water will likely be a rare commodity that must be used sparingly. If you haven’t store enough water for drinking, cooking & cleaning, you might not have any to spare. If you’re using water as a heat source, be sure to be careful and reuse it as often as possible. MOVE YOUR BODY When your body temperature is dropping, a little vigorous movement can warm you up quickly and keep you warm for a while. Jumping in place or doing push-ups is something you can do anywhere space is limited. If you’re hunkered down with the family, try playing games like charades that get you moving. Not only will you start feeling warmer, you’ll be able to get your mind off the miserable cold. PREVENT FOOD & WATER FROM FREEZING Often, when the power is out for long periods of time during cold weather, it’s a good idea to bring your food and water into the area where you’ll be staying to prevent it from freezing. Chances are that if you’re without power, you’ll also have to figure out how to heat your food. If you don’t have a way to cook your food, you definitely won’t want to have to try to figure out how to thaw your food and water that has frozen. Keeping food and water in the same room with you will help you avoid multiple trips to the kitchen, preventing you from letting cold air into the room you’re trying to keep warm. If you do a little work to plan carefully and have a few heat sources on hand, you can feel confident that you’ll be able to survive a few weeks in the cold! A few days after the Teton Dam disaster in June 1976, President Spencer W. Kimball addressed a group of Latter-day Saints at the dedication of the Deseret Mills in Kaysville, UT. This is what he said. The book, Pure Religion, can be purchased at any LDS distribution center or online at amazon.com. Water is one of the most important elements needed for survival. It’s important to store enough for your family in case of emergency. Water can be stored in almost any container, but not all containers will make your water safe for drinking. Use food-grade water storage containers made of thick plastic to store water for drinking. One should store enough water for at least one gallon per person per day. A good rule of thumb is to store at least one 55-gallon barrel of water per person. Never store water containers directly on cement, as the cement will leach chemicals into your water. Place a board under your water containers or prop them up somehow. 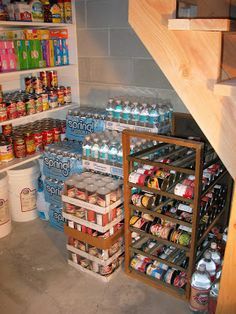 Always leave enough room for expansion if you store containers in the garage because in the winter they may freeze and expand. Before filling containers with clean water, wash the storage container with dishwashing soap and water, and completely rinse with clean water before filling. It is fine to store water for use in washing clothes or flushing toilets in containers that have been used for bleach, detergents or juice. Be sure to label water in those containers as unsafe for drinking. Fill drinking water containers using a clean RV hose. Do not use a regular garden hose. A used garden hose harbors harmful bacteria, which will contaminate the water that flows through it. 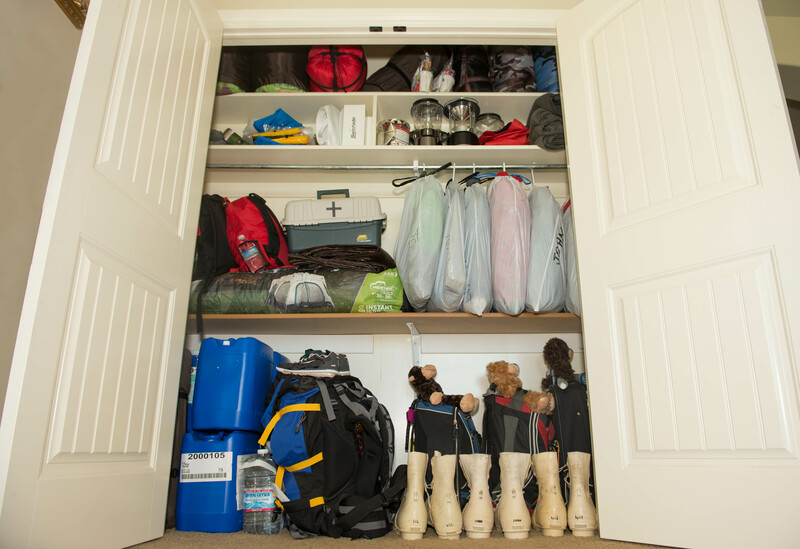 Dedicate a closet, or two (or three), to storing your supplies. Not only will you know exactly where your things are, but you’ll be able to see them, too. If you don’t have a closet, try using a piece of furniture such as an armoire, cabinet, or ottoman, or build your own to fit your space. 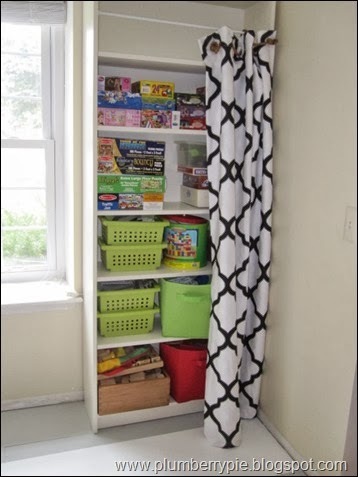 If you have open shelves, hang a curtain rod and curtains to hide your stuff. Not only does it bring some color into your space, but no one will be able to see what’s behind them. A lot of people don’t know what to do with that empty space under the stairs. Pack it in! 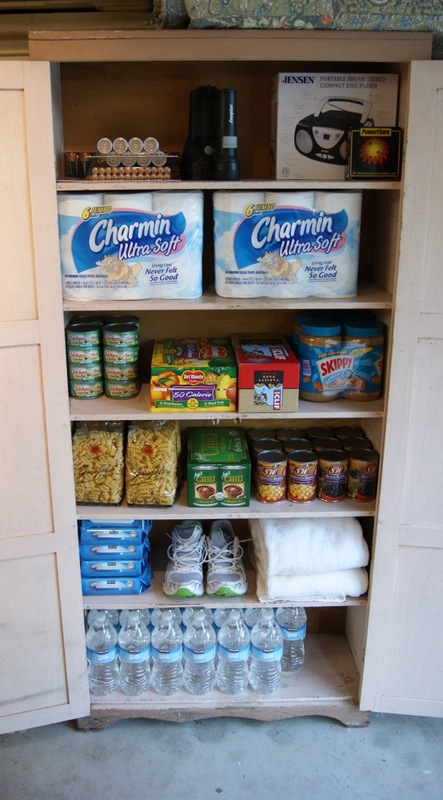 Build or install shelves if you want a more organized space. 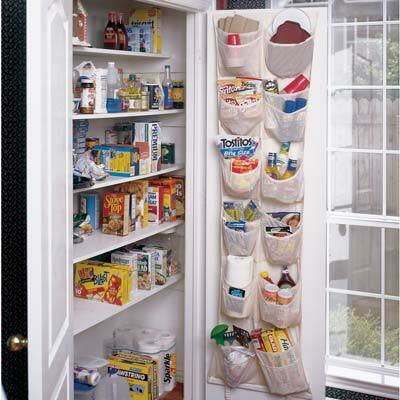 Hanging shoe storage organizers double as food or emergency storage. Hang them inside closets or on the backs of doors. 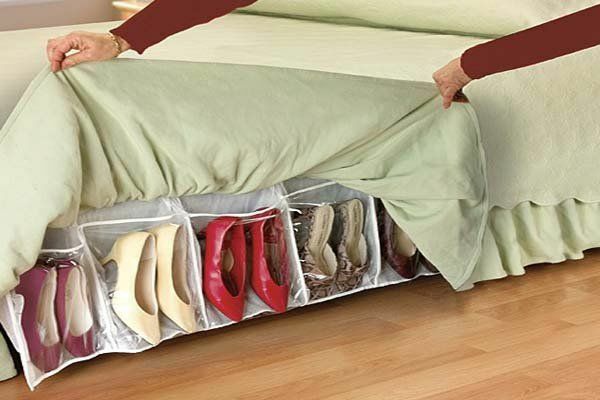 You can even hang them on the side of a bed underneath the bedskirt. There is a lot of square footage under the bed. Use every inch of it! 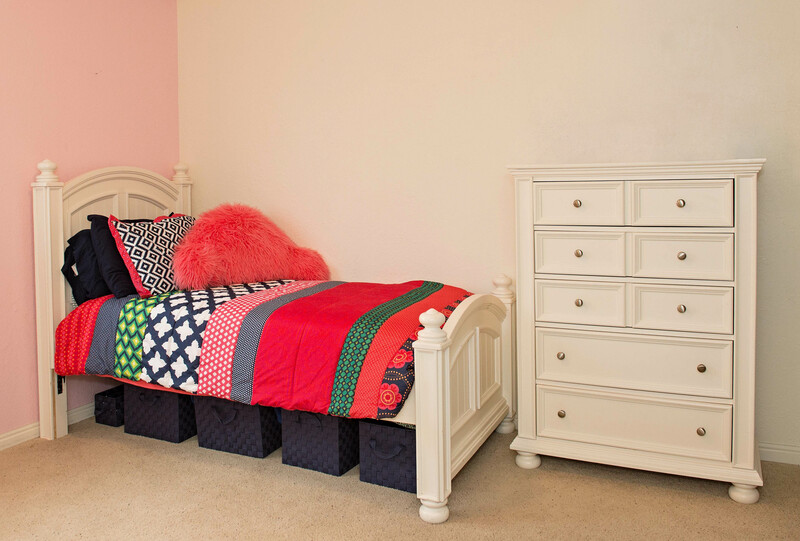 If you’re spatially challenged, consider storing things under a loft bed. 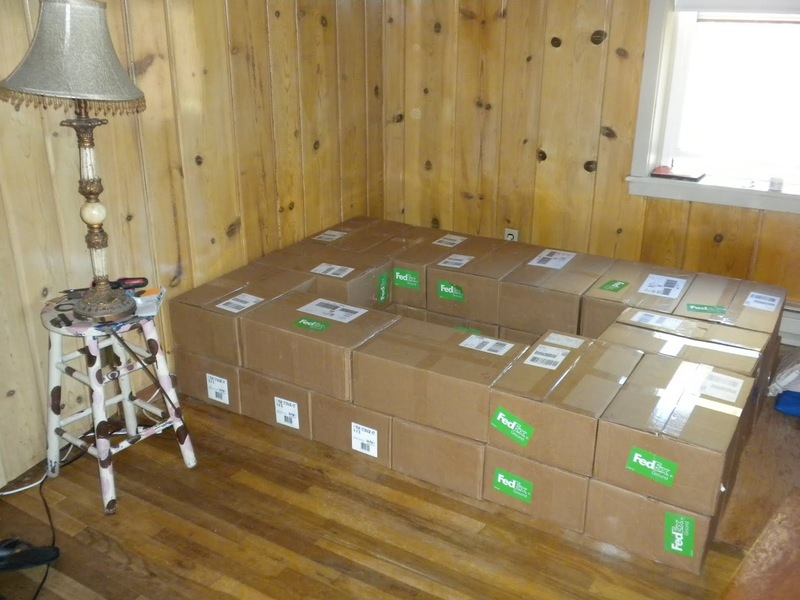 There is a complete year’s supply of food for two people under the loft bed below, hidden behind color-coordinating curtains. No one would ever guess that there is food stored under the bed above. It’s not in the drawers in the platform beneath. It’s in the open space underneath the mattress. 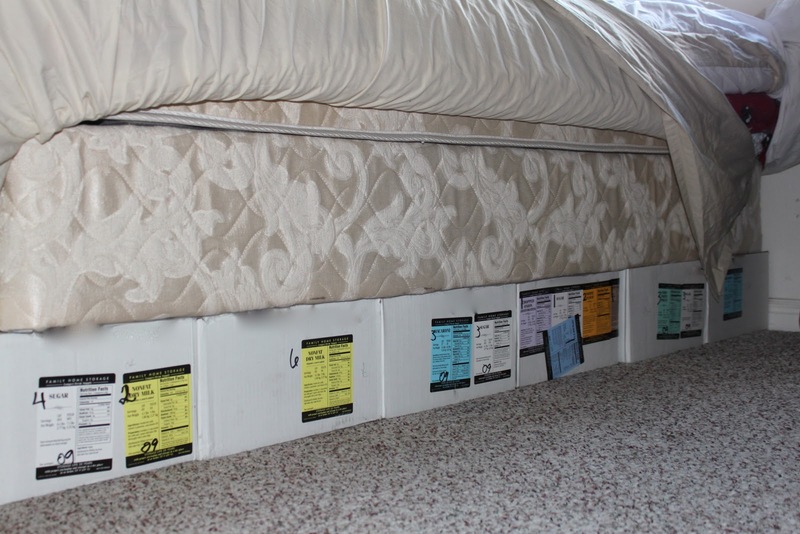 Almost every bed has the capacity to store food underneath. 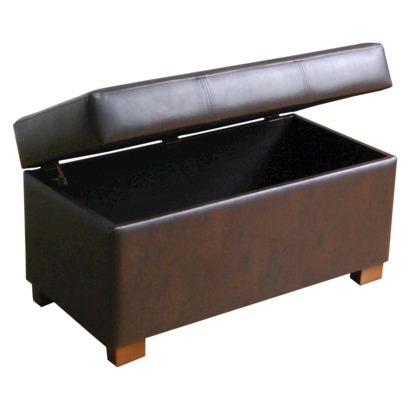 If what you’re storing under the bed is visible and you don’t like the way it looks, put it in a cute storage container. There are so many options available. Can you see the white food storage boxes behind those black plastic bins? Only if you look very closely! Can you see any food in or behind the blue fabric bins in the photo below? You can obey the counsel of the prophets to get your year’s supply of food and still enjoy a stylish living space. 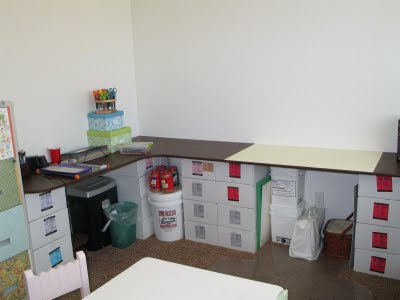 Yes, you can create your own custom furniture pieces from food storage boxes, #10 cans, or water barrels. 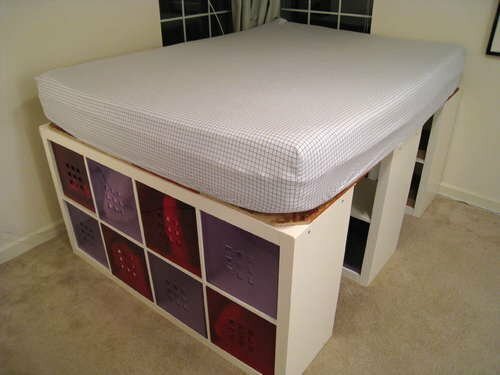 You can even make your own bed frames with the items you store. 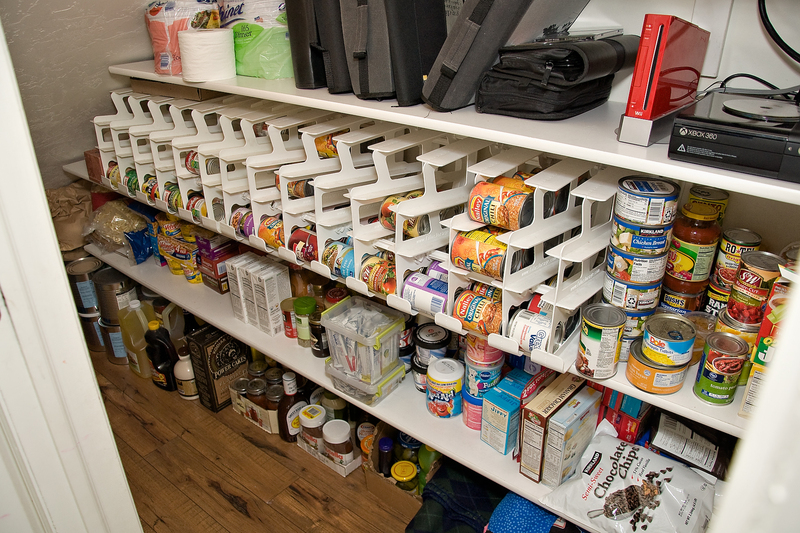 There are so many places to hide your food storage and emergency supplies. 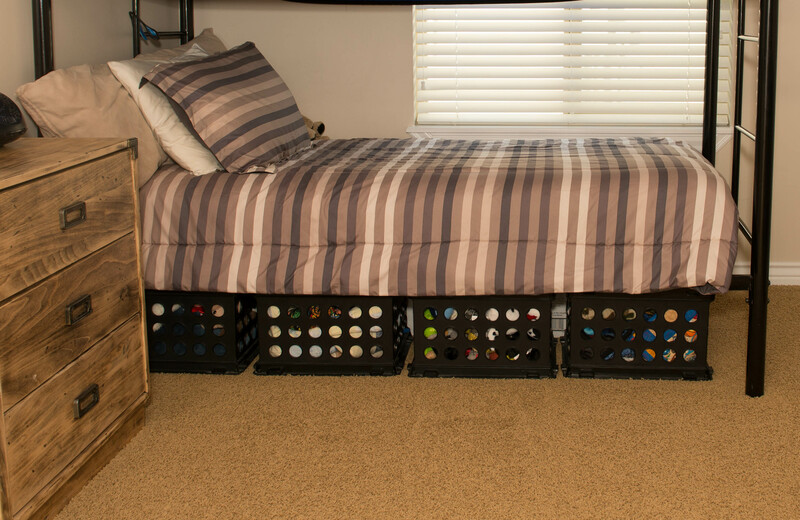 You can make desks, night stands, side tables, accent tables, a really great blanket fort for the kids, or a tower in the middle of the living room, if you desire. The sky’s the limit as to what you can create. “Maintain a year’s supply,” President Spencer W. Kimball said. “The Lord has urged that his people save for the rainy days, prepare for the difficult times, and put away for emergencies, a year’s supply or more of bare necessities so that when comes the flood, the earthquake, the famine, the hurricane, the storms of life, our families can be sustained through the dark days. How many of us have complied with this? We strive with the Lord, finding many excuses: We do not have room for storage. The food spoils. We do not have the funds to do it. We do not like these common foods. It is not needed — there will always be someone to help in trouble. The government will come to the rescue. And some intend to obey but procrastinate,” (Spencer W. Kimball, The Teachings of Spencer W. Kimball, p.375). Don’t procrastinate because you don’t have storage space. Where there’s a will, there’s a way. Pray to find a way. I promise that you’ll be blessed with good ideas and find a way to make it happen, when you commit to follow the prophet and get it done! How Much Food Do We Really Need? For a very long time, our leaders have counseled us to store at least a year’s supply of food. But what does that really mean? So, how much is a year’s supply? There are dozens of food storage calculators out there to help you decide how much and what kinds of foods you should store to create a year’s supply. The Nutrition, Dietetics & Food Science Department at BYU has created a food storage guide that allows for 2000-2400 calories per person per day. This is a good, basic guide. The items on this list can be stored for long periods of time and can be purchased at almost any grocery store or LDS Home Storage Center. 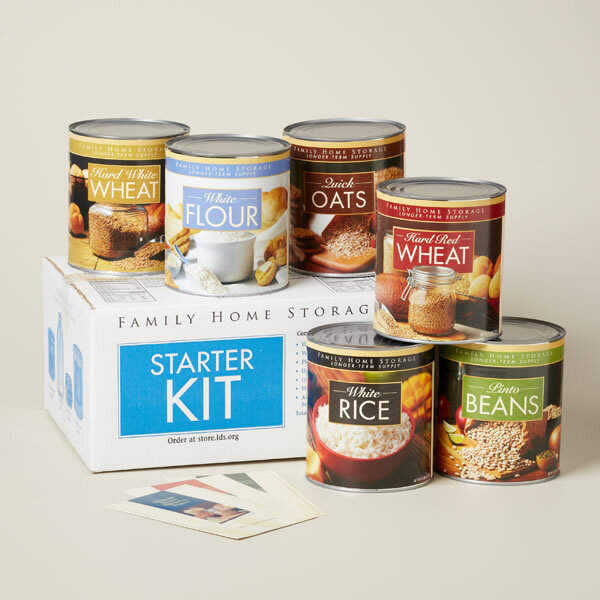 To make this simpler, I’ve broken down the amounts of each item so that you can look at the number of people in your family and know exactly how many pounds or cans of food you’ll need to complete your year’s supply of longer-term food storage items. The short-term items above should be included as part of your year’s supply, although these items have a shorter shelf life than the other long-term items, and must be used or rotated sooner. Most have a shelf life of about 2 years, while the longer-term items generally have a shelf life of at least 10-30 years. It would also be wise to add fruits, vegetables and meats to your supply to improve nutrition, after you’ve acquired the basics. When you realize how much food is necessary to sustain life and multiply it by the number of mouths you need to feed, the numbers can be daunting. But if that year supply is the only food you had and you had to survive for a year by eating only the food that you had stored, you might wish you had stored a lot more. During times of stress, our bodies burn more calories than usual, and since most of our society consumes much more than 2000 calories a day, it would be a really good idea to follow the prophet and store AT LEAST one year’s supply of food. Begin now! Instead of buying another picture frame for that perfectly decorated mantel, make due with what you have, and save. Instead of buying the fancy new toy to take to the lake or the nicer car, make sure you have that year’s supply of food stored away. Maybe you forgo that trip to Disneyland this year and wait until after you have your year’s supply. It will surprise you when you realize how easy it is to acquire a year’s supply and how much peace you will feel from knowing that you are doing what the Lord requires. Elder Victor L. Brown said, “In all that we have said regarding family and individual preparedness, we must never lose sight of the fact that this entire responsibility comes to us from the Lord. He is our Father. It is through his love for us that he so teaches us. All that we have said must be undergirded by a spirit that is in harmony with his teachings. He is our source of inspiration as a Church, as families, and as individuals. He has promised us that if we are prepared, we need not fear. May we be blessed as leaders and as members to follow his counsel to be prepared.” (The Church and Family in Welfare Services, April 1976). Imagine that a natural disaster such as an earthquake, tornado or hurricane has happened. The power is out and the water or sewage plant is out of commission. What are you going to do about using the bathroom? You have a toilet in your house, and it’s safe to go back inside again, but the utilities will likely be out for quite some time. What do you do? If you have a lot of water stored away, you can use some of it to pour in the bowl, which will help create a vacuum to flush your toilet. 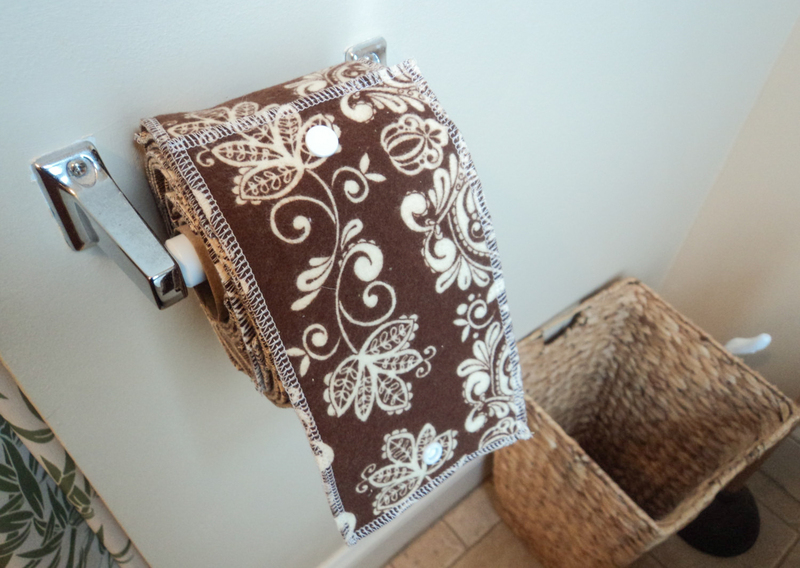 This works and is often a little messy, but it would do for a few flushes. But what if you need to save your stored water for drinking and if the sewer lines are full? They’ll get backed up eventually and then you’ll have one stinky situation on your hands! Often, it’s a good idea to fill up your bathtub(s) with water during an emergency situation while there is still water in your pipes so that you’ll have a little extra for things like watering plants, doing laundry or for bathing. But planning to use this water for flushing the toilet for a long period of time isn’t a good idea, because eventually the sewer system will get backed up. The problem becomes how to be able to go to the bathroom without using the toilet in your house, how to keep your family from becoming sick and how to keep your house from smelling like the sewer. It’s important to know how to dispose of waste in the proper manner to avoid cross-contamination of your water supply and to avoid disease. You can use the toilet in your bathroom by shutting off the water to the house and to the toilet. Flush the water out of the bowl. Plug up the hole at the bottom of the toilet with something like a small foam ball or some rags to help prevent backed up sewage from coming into your home. Then line your toilet bowl with a 13-gallon heavy-duty plastic garbage bag (I personally prefer black so that when you remove it from the toilet, you don’t have to see the contents). Duct tape the edges of the bag to the toilet. Add a cup of kitty litter or dried organic material such as leaves or wood shavings to the bag each time you use the toilet or pour in a little bleach or lime to help reduce odors. When the bag is full, remove it and tie it in a knot or use a twist tie to make sure it’s closed. Put a garbage bag inside the bucket. Fold the edges of the bag over the top of the bucket and cinch it tight or tape the bag to the side of the bucket. 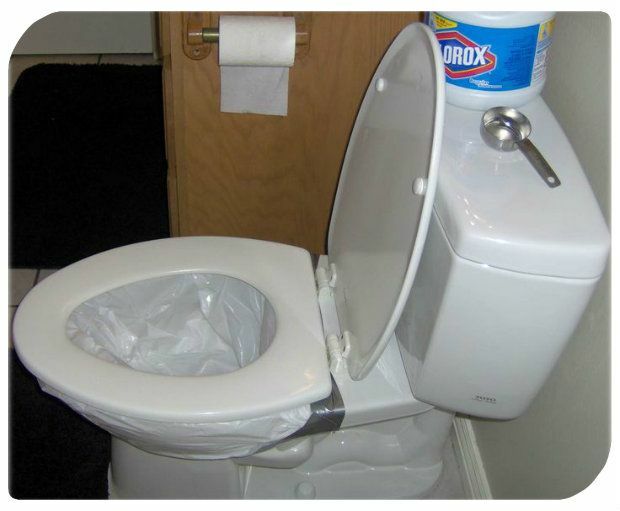 Place the toilet seat on top and secure into place. In a separate bucket nearby, keep your kitty litter, bleach, lime or dried natural composting material. Use the toilet as you normally would. Take a scoop of kitty litter, dried composting material, bleach or lime and cover up your “stuff.” When the bag becomes full, remove and cinch the top. Bury it in a safe location, away from all water sources. 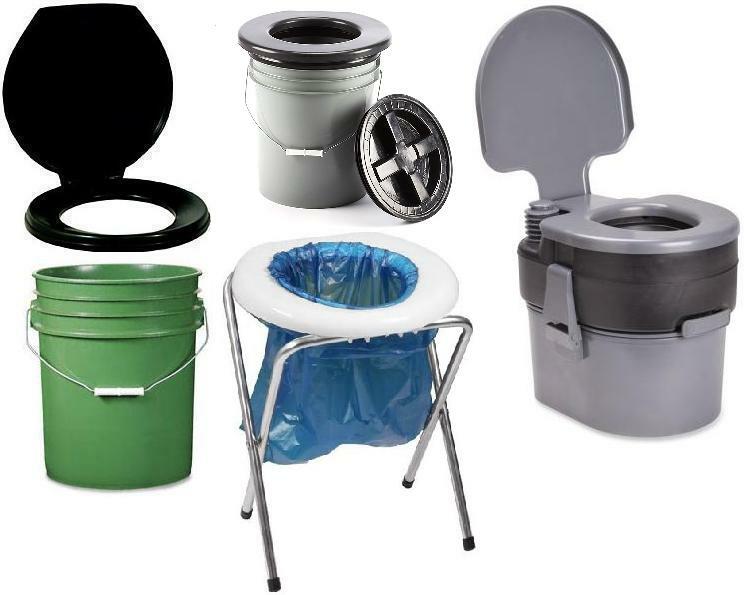 You may want to find a way to stabilize your camp toilet so you don’t fall over while you’re using your bucket. 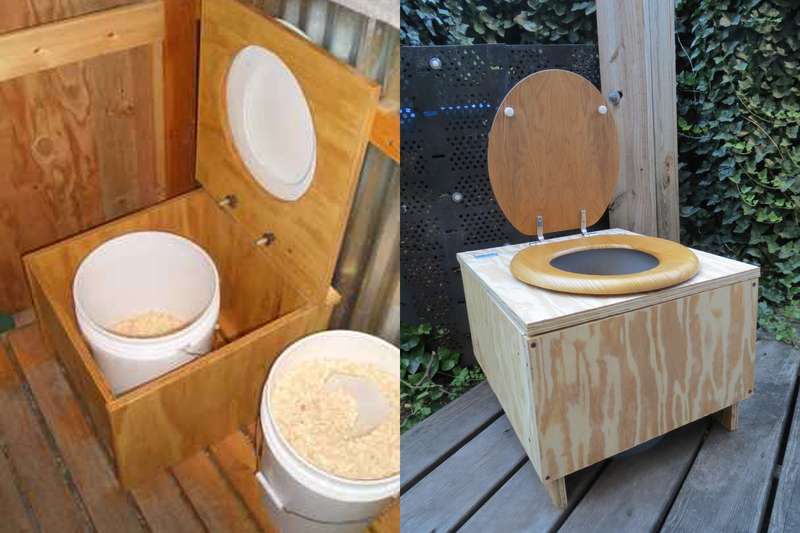 There are lots of free building plans online to help you build your own toilet surround or you can purchase a pre-made toilet stabilization device. Some people prefer using two separate buckets. One for liquids and one for solids. The liquid waste, if completely separated from the solid waste, can be safely disposed of in your yard. This can be helpful because then you only have to worry about burying the solid waste. One should also consider using two buckets when sickness or disease is an issue. No one wants to risk contamination when there are others using the toilet who may have gastrointestinal issues. There should always be a separate area for those who are sick and need to use the restroom. And be sure to carefully sanitize, use proper cleaning procedures and not use a sick person’s waste in composting. Everyone has an opinion on the best way to safely eliminate waste. According to the Humanure Handbook, “The rationale for separating urine from feces is that the urine/feces blend contains too much nitrogen to allow for effective composting and the collected refuse gets too wet and odorous. Therefore, the urine is collected separately, thereby reducing the nitrogen, the liquid content, and the odor of the collected refuse. However, there is a little know alternative method of achieving the same result which does not require the separation of urine from feces. Organic material with too much nitrogen for effective composting (such as a urine/feces mixture) can be balanced by adding sufficient carbon material such as cellulose in the form of sawdust or a similar material, rather than removing nitrogen. The extra carbon material also absorbs excess liquids and can cover the collected refuse to eliminate odor completely,” Humanure Handbook, p. 86-87. Did you know that human waste can be used to create compost for gardening? It must be done properly to make it safe, but that’s always an option. To learn more about “Humanure,” click here. Have you heard of family cloth? Many people are already using these. These are basically wipes made of fabric. You can make your own from fabric scraps or even purchase them online. Store them dry in a box, soak them in water or a bleach/water solution when dirty, and clean them with boiled water. Or, like much of the rest of the world, use water. 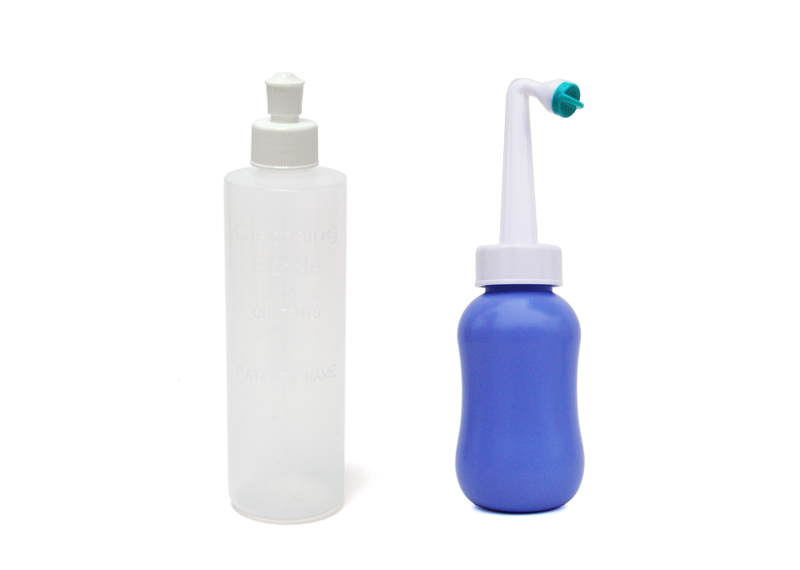 You can purchase a portable bidet or peri-bottles(the kind that women use for post-partum cleanup). Peri-bottles are inexpensive and easy to use. Just because there’s an emergency, doesn’t mean the “poop” has to hit the fan. Knowing your options and being prepared can provide you with the knowledge to keep your family safe and healthy, while making it a little easier to function in an already uncomfortable situation. Have you ever thought about the possibility of an earthquake? Are you prepared? There are many things you can do before, during and after an earthquake to help you have a better chance at survival. 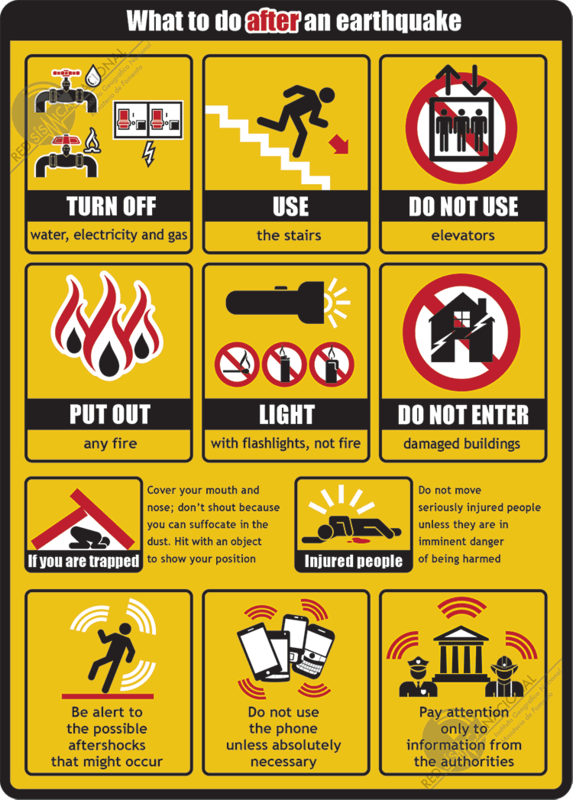 Become aware of fire evacuation and earthquake safety plans for all of the buildings you occupy regularly. Pick safe places in each room of your home, workplace and/or school. A safe place could be under a piece of furniture or against an interior wall away from windows, bookcases or tall furniture that could fall on you. Practice “drop, cover and hold on” in each safe place. If you do not have sturdy furniture to hold on to, sit on the floor next to an interior wall and cover your head and neck with your arms. 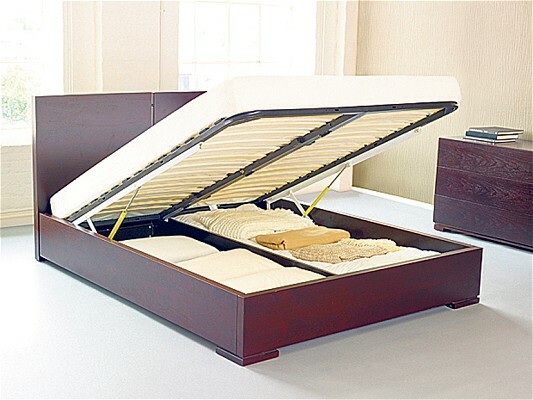 Keep a flashlight and sturdy shoes by each person’s bed in case the earthquake strikes in the middle of the night. Make sure your home is securely anchored to its foundation. Bolt and brace water heaters and gas appliances to wall studs. Bolt bookcases, china cabinets and other tall furniture to wall studs. 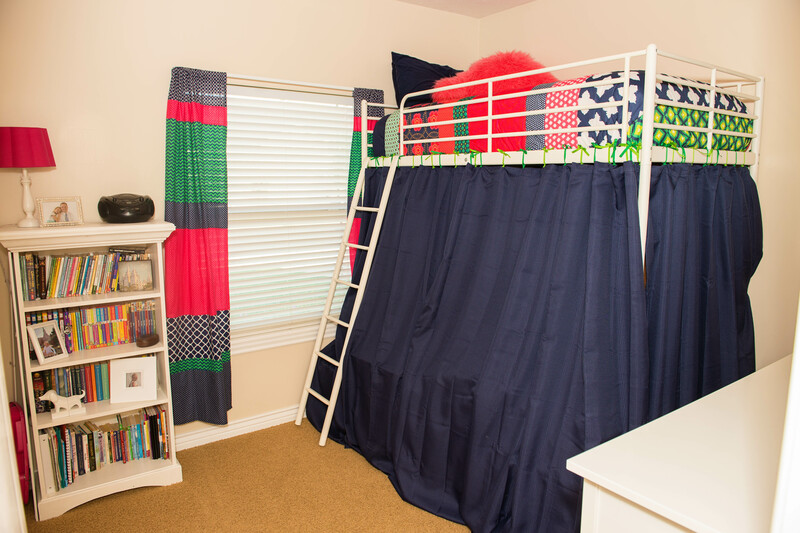 Hang heavy items, such as pictures and mirrors, away from beds, couches and anywhere people sleep or sit. 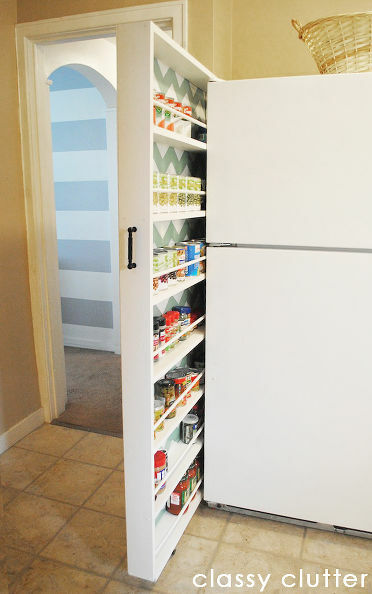 Install strong latches or bolts on cabinets. Large or heavy items should be closest to the floor. Learn how to shut off the gas valves in your home and keep a wrench handy for that purpose. Learn about your area’s seismic building standards and land use codes before you begin new construction. Here is a video on HOW TO PREPARE for an earthquake (not affiliated with this site). It would be a good idea to have a 72 hr kit of supplies, along with a smaller bedside emergency kit. You never know when an earthquake will happen and you may have to leave the house in the middle of the night or you might even become trapped in or near your bed. 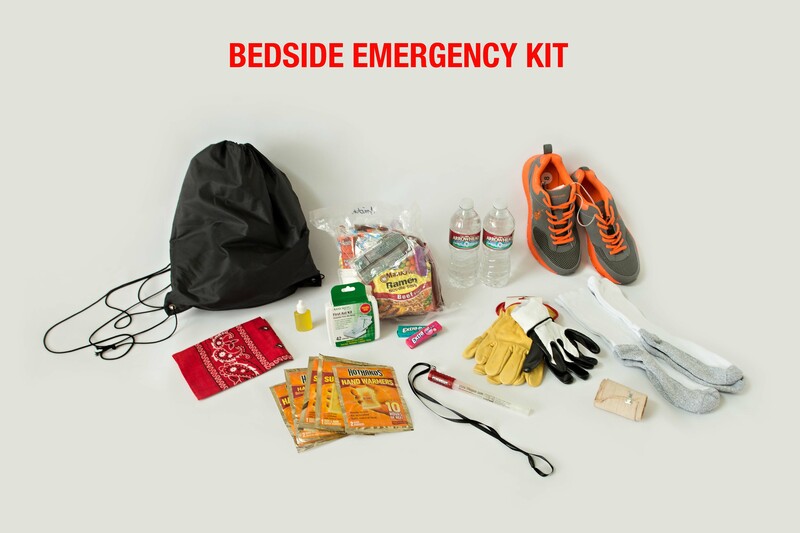 A bedside kit filled with essentials such as water, snacks, shoes, socks (to cover your arms or feet), a whistle, flashlight or glowstick, mini first aid kit, and handkerchief could easily mean the difference between injury and safety, or life and death. The following is an example of a bedside emergency kit. Having the knowledge of what to do during an earthquake can significantly reduce your changes of becoming injured. Drop, cover and hold on. Move as little as possible. If you are in bed, stay there, curl up and hold on. Protect your head with a pillow. Stay away from windows to avoid being injured by shattered glass. Stay indoors until the shaking stops and you are sure it is safe to exit. When it is, use stairs rather than the elevator in case there are aftershocks, power outages or other damage. Be aware that fire alarms and sprinkler systems frequently go off in buildings during an earthquake, even if there is no fire. Find a clear spot (away from buildings, power lines, trees, streetlights) and drop to the ground. Stay there until the shaking stops. If you are in a vehicle, pull over to a clear location and stop. Avoid bridges, overpasses and power lines if possible. Stay inside with your seatbelt fastened until the shaking stops. Then, drive carefully, avoiding bridges and ramps that may have been damaged. If a power line falls on your vehicle, do not get out. Wait for assistance. Here is a video on what to do DURING an earthquake (not affiliated with this site). After an earthquake, the disaster may continue. Expect and prepare for potential aftershocks, landslides or even a tsunami. Tsunamis are often generated by earthquakes. Each time you feel an aftershock, drop, cover and hold on. Aftershocks frequently occur minutes, days, weeks and even months following an earthquake. Check yourself for injuries and get First Aid, if necessary, before helping injured or trapped persons. Put on long pants, a long-sleeved shirt, sturdy shoes and work gloves to protect against injury from broken objects. Look quickly for damage in and around your home and get everyone out if your home is unsafe. Listen to a portable, battery-operated or hand-crank radio for updated emergency information and instructions. Check the telephones in your home or workplace to see if you can get a dial tone. Make brief calls to report life-threatening emergencies. Look for and extinguish small fires. Fire is the most common hazard after an earthquake. Clean up spilled medications, bleach, gasoline or other flammable liquids immediately. Open closet and cabinet doors carefully as contents may have shifted. Help people who require special assistance, such as infants, children and the elderly or disabled. Watch out for fallen power lines or broken gas lines and stay out of damaged areas. Keep animals under your direct control. If you were away from home, return only when authorities say it is safe to do so. Use extreme caution and examine walls, floors, doors, staircases and windows to check for damage. Be careful when driving after an earthquake and anticipate traffic light outages. Here is a video on what to do AFTER an earthquake (not affiliated with this site).